Leave the motorway and continue straight ahead, keeping on the right hand lane. Once you reach the roundabout, take the third exit and continue straight ahead until the next roundabout, and take the second exit. Continue straight ahead until you reach the seafront, turn right and continue for about 2 km until you reach the bathing establishment number 62, then turn right in Viale Garian. You have reached the Hotel Villa Paola. Torre Pedrera train station: 550 meters by foot. Proceed eastbound towards Viale Eritrea, continue straight onto Viale Brava, turn right to remain on Viale Brava, continue along Via Gibuti, turn left and take Viale Chisimaio. Then turn right and take Viale Mogadiscio, turn left and take Viale Garian. 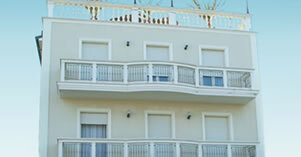 You have reached the Hotel Villa Paola. Outside the train station (without crossing the street), on your left, you will find several bus stops. Take the No. 4 bus and get off at stop No. 28. Continue for 30 meters until you reach Viale Garian on your left. You have reached the Hotel Villa Paola. only if you book online through our website!